The Amsterdam Wharf occupies a site of 529 square meters including the main space, side reception corridor and catering area. The rear pontoons provide an additional 136 square meters of activity area as well as boat docking. The waterside pontoon adds a useful relaxing area and may be lit at night. Being Holland though, the weather can be a factor! There are two large main ‘dock doors’ allowing easy dual ‘Get-in’ access for catering, technical and decoration hardware. The main dock doors are large enough to drive a 4x4 vehicle straight into the building. The general decor is neutral but may be enhanced by architectural dressing, flowers, plants or theatrical/conference dressing depending upon the atmosphere of the production or function. 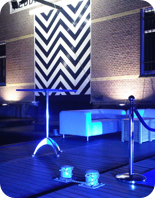 Architectural and Stage Lighting also plays an essential role in creating the mood and atmosphere. An almost invisible ‘picture hanging’ system is installed in the venue for mounting posters, banners and images. The Wharf has a stock set of general furniture suitable for any layout. Other styles of furnishings or elements are obtained as required. Straight in from the left hand dock doors is the catering storage and preparation area leading straight to a kitchen area. All services are available in the kitchen area with ample power. 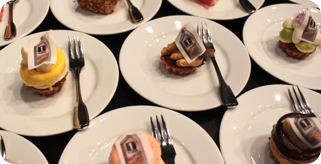 Numerous Top Caterers have provided sustenance at the Amsterdam Wharf. We have close relationships with many of the top caterers in the Netherlands and can advise on the best solution for any event. There is secure off-road parking close to venue. This may be accessed by water taxi or by shuttle bus or both.